- Dual Fisheye lens,720° panoramic view,720°seamless stitching technology,360x360 field of view,record all the details without dead zone. - 360°Virtual Reality immersive feel fantastic,will provide fully immersive totally convincing virtual realit. - With built-in real-time video stitching,you can share your VR snapshot and video to Facebook,YouTube and other social platforms. - Support Type-C & Micro-USB,Support Android 5.0-7.0. - Small and exquisite,enjoy the whole world in your hands.Ultra portable,comes with small like a table tennis, take it easily in your pocket or bag. 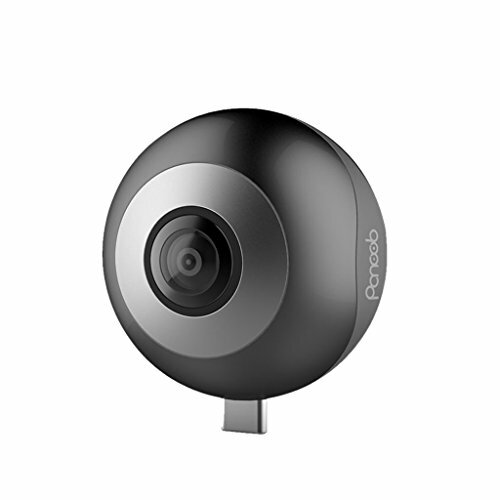 Dual Fisheye lens,720° panoramic view,720°seamless stitching technology,360x360 field of view,record all the details without dead zone. 360°Virtual Reality immersive feel fantastic,will provide fully immersive totally convincing virtual realit. With built-in real-time video stitching,you can share your VR snapshot and video to Facebook,YouTube and other social platforms. Support Type-C & Micro-USB,Support Android 5.0-7.0.